Radars are used to determine the positions, speeds, etc. of objects on land, at sea and in space (automobiles and other vehicles, hills, mountains, ships, spacecraft including satellites, large and small rocket projectiles, etc.). Radar uses an echo method. During a very short time, for example, 1 microsecond (1 μsec), a high-frequency signal of high energy is emitted, the so-called energy pulse. This signal propagates rectilinearly in space with a speed equal to that of light (300 meters per microsecond). If that signal strikes a reflecting object on its path, a part of the signal is reflected back into the direction of the emitter. The radar receives this echo and determines the time that has elapsed between emitting the pulse and receiving the echo. This time determines the distance from the radar to the object (and back). After all, 1 μsec corresponds to an object distance of 150 metres. The antenna of the radar concentrates the emitted energy in a certain direction in a narrow beam. The larger the antenna size, the narrower the bundled energy beam will be. By turning the antenna, the direction of the radar beam changes. The direction of the object is the same as the direction in which the high-frequency signal is emitted and its reflection has been received. The energy density of this high-frequency signal in the beam decreases by 1/R2, where R is the distance. Likewise, the energy density of the echo with 1/R2 will decrease, so that the finally received signal strength of the echo is proportional to 1/R4. After a certain distance, the signal strength of the echo so weakened that detection of an object can no longer take place. This distance is dependent upon, among other things, the transmitting energy, the antenna size, the sensitivity of the radar, and the reflective power of the object to be detected. A conventional radar antenna usually consists of a revolution paraboloid that is irradiated from the focal point. The high-frequency waves (microwaves) reflected by the paraboloid will all arrive in a plane perpendicular to the axis of symmetry of the paraboloid with the same phase (property of a paraboloid). This is called the phase-like or equiphase plane. By far the largest part of the emitted energy by the paraboloid propagates in a direction perpendicular to this equiphase plane, and, in this case, in the direction of the axis of symmetry of the paraboloid (main beam). The degree of bundling depends on the size of the equiphase plane, measured in wavelengths and thus on the antenna dimensions. The larger the antenna the smaller the main beam. It can be noted that additional bundles also arise, which, however, can be kept relatively small by taking known measures. Therefore, when the paraboloid rotates about an axis perpendicular to the axis of symmetry, the position of the equiphase plane in the space and thus also the direction of the transmitted beam change. On board of current ships, the most common antenna variant is a slotted array antenna. Such an antenna can be recognized by a rotating beam. Instead of a parabola, we find a pipe with access to a distance of the wavelength (at 10 GHz it is about 3 cm). The transmission signal is applied at one side of the pipe and is radiated through the slots. This antenna works as a “linear array” (see next paragraph) but without adjustable phase shifters. Just as with the parabola, there is an equiface plane, which is however cylindrically curved. As a result, the beam does not have the shape of a cone but of a flattened cone with a vertical opening angle. Aeroplanes at different heights can be observed. In the early 1960s, TNO started the development of phased array radars; that are radars whose antenna is stationary. The position of the equiphase plane of this type of antennas in space can be changed very quickly with electronics. These stationary antennas are therefore also called inertia-less antennas. Such an antenna is made up of many elements and is therefore also called array antenna. Each array element is basically provided with a phase shifter, a component with which the phase of the high-frequency signal can be set electronically between 0° and 360°. Each equiphase plane is formed by a corresponding phase setting of each array element. If the array elements are only in one row, the antenna is called a linear array. A planar array consists of more rows of array elements that lie in a flat plane. For arrays, the distances between the array elements and the desired equiphase plane determine the phase setting of the phase shifters. Depending on the phase settings, the antenna beam can be steered in any desired direction, in practice between about + and – 45° with respect to the unaffected transmission direction. To search the hemisphere one needs at least four planar arrays. The aforementioned phase setting changes can be realised electronically with the aid of a computer in a few microseconds. Thus, the transmitted beam of energy will also be able to change state in a few microseconds. The beam of a phased-array antenna jumps from one position to another, in contrast to the conventional rotating radar antenna where the beam position changes continuously with time. Due to the existence of simple and complex radar systems of conventional and inertial design, a comparison between the two embodiments is not easy. Nevertheless, there are still some advantages and disadvantages. The main advantage of an inertial radar antenna compared to the conventional antenna is that the energy is only emitted in the desired directions and at the right time. In this way, the energy and available time are used more efficiently. A conventional surveillance radar emits about five radar pulses per direction. The energy of this is generally divided for each pulse in elevation into a wide beam, while in the horizontal plane the beam is kept as small as possible. In this way, the direction of the object in the horizontal plane and the distance is accurately determined, while the height is determined less accurately due to the wide beam in the elevation plane. If the height must also be determined accurately, the direction in the horizontal plane will be transmitted to a second radar, the so-called altitude measurement radar. This radar accurately determines the height and distance, while the direction in the horizontal plane is now inaccurate. The combination of these two radars forms a three-dimensional radar since the three coordinates of an object are determined by this. If one is further interested in which direction a fast moving object moves, the new position of the object will have to be determined after the end of small time intervals. One can think of object speeds between 300 m/s and 6 to 10 km/s. With a conventional antenna, a new position determination will only take place after a full rotation of the antenna. This means a loss of time of millions of microseconds. Given the desired extremely short reaction times of the modern radar defence systems, every microsecond is very important. With a conventional radar, the position of an object found with the search radar(s) can also be passed on to a so-called full-scale radar, which then has to be rotated from object to object in order to determine the new positions. Such a radar is often used simultaneously to guide a missile to a hostile object. In that case, the radar beam continuously remains focused on the hostile object and no other objects can be tracked. The radar beam of a phased-array antenna can transmit the energy from pulse to pulse from one direction to any other random direction. This radar beam is narrow both in the horizontal and in the vertical plane so that the three coordinates of the desired object can be accurately determined simultaneously with the same beam. In this way, the phased-array radar can quickly switch between its search, follow and guide functions. The operation of all these functions is also centralised in one computer so that the loss of time for transferring the information from one function to another is smaller than when three separate radars are used. One pulse per direction can be transmitted with the radar antenna. If this transmission results in an echo, more pulses can be sent in the same direction. If no echo is received, no subsequent pulses are transmitted in that direction. The next pulse is then sent in a different direction. For the search function, a gain of a factor of two is obtained with this method of working compared to the rotating antenna. This way of working is called ‘sequential detection’ and is not possible due to the fixed revolving speed with a conventional radar antenna. When tracking objects, the time gained from the phased-array radar is large, allowing many more targets to be tracked simultaneously. If the beam is changed in a regular manner, for example, to systematically search the environment, the bundles will partially overlap. The size of the overlap can be chosen randomly and changed from moment to moment. An extra phase distribution over the array, superimposed on that for the formation of the equiphase plane, makes it possible to widen the radar beam. The environment can now be searched faster with a reduced distance range. With the help of this universally usable technique or with the help of other applications with special array constructions, the directions of the much smaller secondary beams can also be changed. A radar with an electronically controlled beam is also much more resistant to interference attempts by another radar transmitter (“jamming”). If the fault arrives via a secondary beam, the own antenna can be made insensitive to the direction of the jammer. In the event that the fault arrives via the main beam, the own beam can be kept focused on the object for a longer period of time. In this way, the position of the object can usually be determined (so-called burn-out). These latter possibilities are missing with the conventional radar. With certain array antenna constructions, it is possible to feed parts of the antenna with other energy sources. Very large capacities are therefore possible with phased-array antennas. An equiphase plane can also be realised with any arbitrary array surface so that the shape of the phased-array antenna can be adjusted to the circumference of a vehicle (aircraft). In order to obtain good antenna properties, the distribution of energy across the antenna face must be as close as possible to the theoretically optimal distribution, something that can be achieved better with the most inertial antenna constructions than with the conventional version. The use of thousands of array elements and thus also thousands of phase shifter and from a few to thousands of energy sources in the planar phased-array antenna has the consequence that the failure of some of them has no noticeable influence on the operation of the radar. In 1962, the TNO Physics Laboratory was commissioned by the Royal Netherlands Navy to start investigating the properties of ferrites as a phase shifter. The magnetisation of a ferrite in a waveguide influences the phase of an electromagnetic wave through a waveguide. 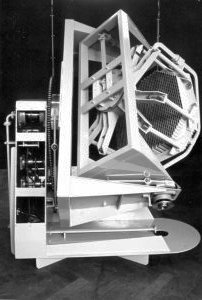 In 1963, a phase-mechanical scanning system was realised with a linear array. The electronic phase scan occurred in the horizontal plane and a mechanical movement was omitted. The phase setting was done by hand. The antenna properties for the scanning angles set in this way were measured. The self-developed and constructed phase shifters then had a switching time of approximately 100 μsec. In the course of the 1960s, new phase shifters were developed and produced with a switching time of approximately 6 μsec. The manual setting was replaced by a computer setting. A receiver and a Teletrack radar display case (see: digital technologies/radar image processing) were added to the transmitter to create a complete radar installation. With the aid of a parabolic cylinder as a reflector, the beam is narrowed in the plane perpendicular to the scanning plane. At the half energy value, the radar beam width in all intersections was 3°. Ninety per cent of the space was occupied by the waveguide construction with which the energy was distributed and in which the microwaves were passed to the phase shifters of the array elements. This old construction could already be made considerably smaller in the early 1970s. Each of the 40 phase shifters had its own electrical control card, the so-called driver. The phase shifter consisted of a waveguide partly filled with ferrite, a ceramic magnetic material. A change in the magnetic state of this ferrite caused a change in the phase setting. A single electric wire ran in the longitudinal direction through the heart of the ferrite. Depending on the duration of the current pulse through this wire, the desired phase setting between 0° and 360° was obtained. The radiation pattern of the linear array was easy to measure by rotating the antenna on a rotating drum at a certain set beam direction (scanning angle). With a receiving antenna fixed at a distance, the radiated energy was then measured as a function of the direction angle. For a planar array, where the beam direction can be set in two dimensions, measuring the antenna pattern is much more complicated. A gimbal setting was required to direct the main beam to the receiving antenna for each set scanning direction. The arrangement had to be able to measure all intersections through the main beam. This planar array was of the reflection type, that is, an array consisting of many reflective array elements in a flat plane. 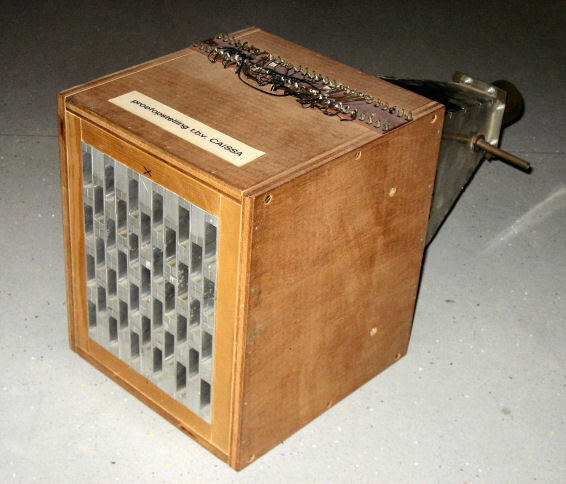 This was the forerunner of a later electronically controlled planar array. The phases of the various reflect the array elements (each array element consists of a piece of an open waveguide on the other side closed with a piston) could be set mechanically by means of the positions of said pistons in the waveguides. The array itself was irradiated with a microwave heater. The reflected radiation then consisted of the collective reflection of all array elements. The direction of the reflected beam was determined by the phase setting of the various reflective array elements (position of the pistons). The mechanical piston setting was calculated with a computer. 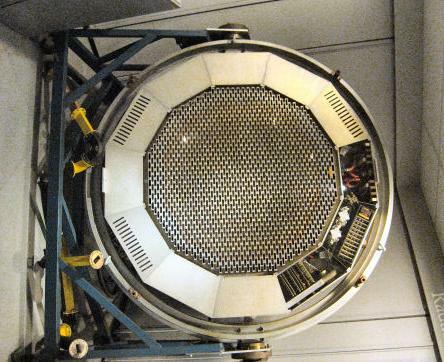 All kinds of research were performed with this reflection array, from which information was obtained for the construction of a fully electronically controlled phase-phase array in 1971. 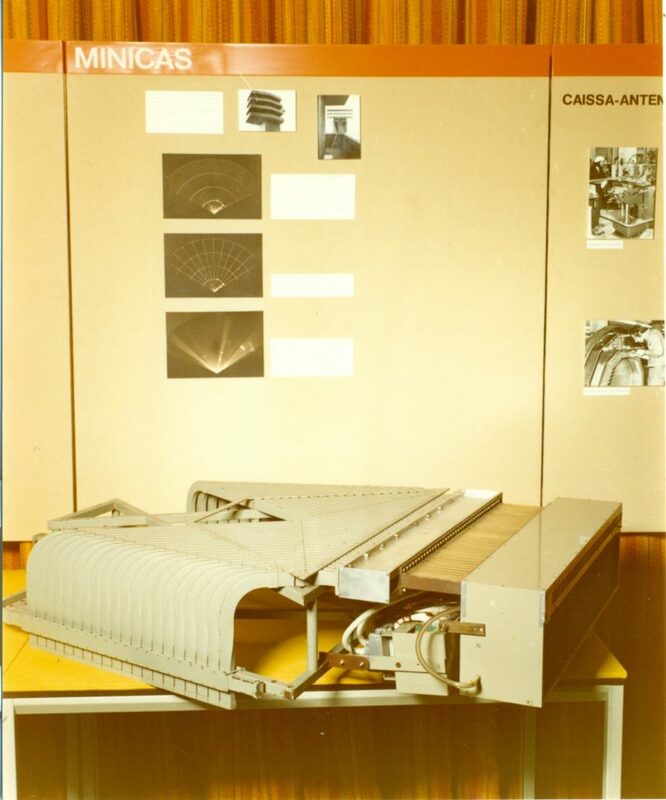 This Computer Assisted Inertialess Scanning System Array (CAISSA) system contained a small thousand array elements that are open at both ends (transmission array). The primary microwave radiator irradiated the array. This radiation went through all the corrugated pipes and the ferrites and came out again on the other side of the array plane and formed the desired beam there. 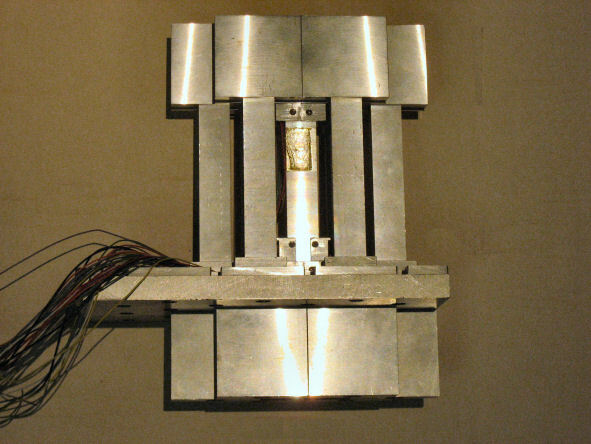 The direction of this beam was determined by the phase setting of the phase shifters. The CAISSA antenna contained 850 C-band (5.4-5.9 GHz) ferrite phase shifters: a piece of a waveguide in which a ferrite rod was mounted. The antenna had a scan angle of -60 to +60 degrees. A hole was drilled in the ferrite rod in the longitudinal direction, through which a wire was pulled. A current sent through the wire affected the phase shift of the microwaves in the ferrite and thus the phase setting of the phase shifter. The phase settings of the phase shifters in the CAISSA antenna were computer controlled. A disadvantage of a ferrite phase shifter is that the phase shift from input to output is not equal to the phase shift from output to input (no symmetry). As a result, for receiving the signal a small correction was always necessary to ensure that the antenna at received the signal from the same direction as when transmitting. This caused a short distance in which the radar is blind. 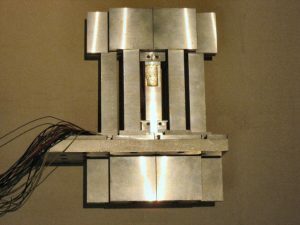 After the completion of CAISSA and the completion of the antenna measurements in the early 1970s, it was decided to use the antenna in an experimental radar FUCAS (Follow Up CAISSA). 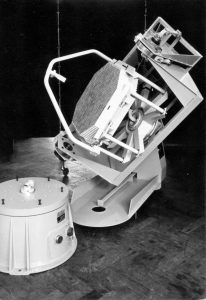 In the period 1975-1976, Operations Research simulated the operation of the FUCAS radar with Fortran programs before the FUCAS setup was technically ready. This enabled the development of the higher level of control software. FUCAS alternated between scanning, tracking and passive listening modes and changed its emission frequency in case of clutter or jamming. 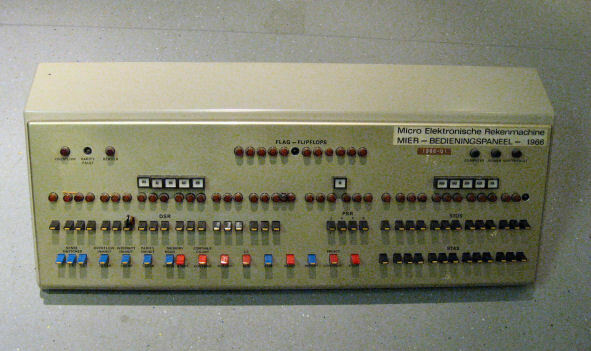 The Electronics Group made the self-built control computer MIER (Micro Electronic Calculator), interfaces and the ‘low-end control’. The FUCAS project ended in 1984. In the FUCAS project various properties of phased-array systems were investigated. 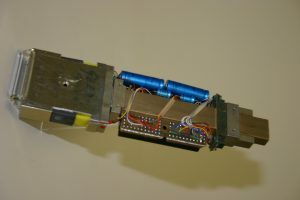 The search and tracking of targets using the electronically adjustable antenna beam proved to be much faster and more efficiently than in a conventional radar system. Moreover, the application of monopulse to quickly and accurately determine azimuth and elevation of target echoes was investigated, as well as the new possibilities for detecting moving targets against a background of clutter (reflections of terrain and precipitation) and to oppose deliberate interference. The knowledge and experience gained in CAISSA and FUCAS were later applied in phased array radars TOEKAN (not fully developed; use was made of phase shifters based on thin film technique in which metal traces were applied to alumina (Al2O3 and a ceramic substrate with chip components thereon), and in EXPAR and APAR. The latter two are Phased Array systems where each antenna element has its own transmitter and receiver. Use is made of Monolithic Microwave Integrated Circuits (MMIC). The intention of EXPAR was to increase the knowledge of the design of an affordable active antenna element for a phased array in the X band (wavelength 3 cm). The element price plays a major role because of the large number, more than 3000, of elements in the radar antenna. An important choice to lower the price was the large-scale application of GaAs MMICs, with which an antenna element could be obtained that is light and compact and that combines good technical performance with the required reproducibility. At the beginning of 1992 the design proved to meet the set specifications in terms of potential, while the desired price limit of $500 could also be met by mass production. The required combination of the elements, first in a building block of four elements (quad) and subsequently in a column assembly of 32 quads, were also been designed and built. An Engineering Development Model was built in 1996, which was then tested ashore and later on board as a precursor to APAR. The Active Phased Array Radar (APAR) was developed by a consortium of Hollandse Signaal, Northern Telecom Ltd (Canada), DASA (Germany) and, the TNO Physics and Electronic Laboratory. The contract was signed in July 1993 by the defence ministries of Canada, Germany, and the Netherlands. APAR is a radar that can perform various tasks simultaneously, such as searching the horizon, detecting and tracking targets at low altitudes (such as missiles flying directly above the sea), within a certain detect and track all objects, and collect target information for their own missiles. This advanced radar will protect especially against the threat of low-flying missiles, which are getting faster and smaller. APAR has been developed for and installed at air defence and command frigates (LCF) of the Royal Dutch Navy, the F-124 frigates of the German Navy, and the Canadian Patrol frigates. APAR has been installed on the frigates of the Royal Netherlands Navy. 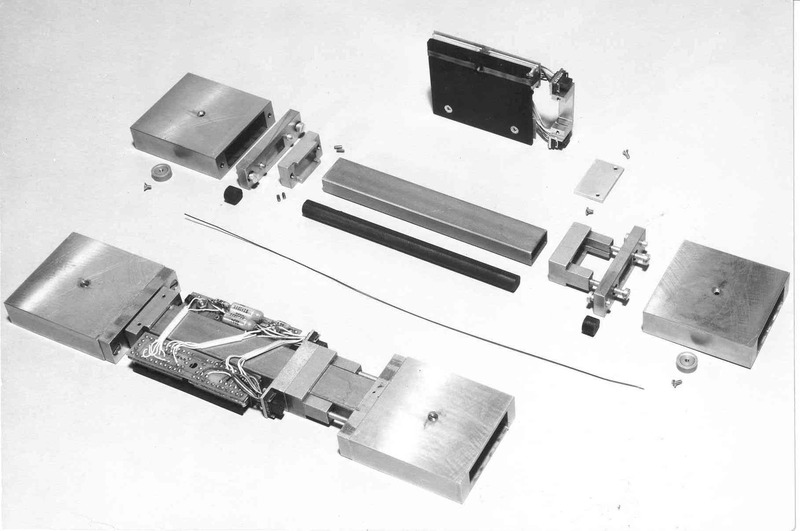 EXPAR was an experimental system developed in cooperation between THALES and TNO-FEL. MIER (Micro Electronic Calculator) used the first integrated circuits from Texas Instruments (flat package version where special binding techniques had to be used for the assembly). Toroidal memory 4096 × 20 bits. Control developed in-house. Program entry was made with this control panel (manually) or with punch tape. The background text on phased array radars was derived from the publication in Dutch by Dr. J. Snieder “Nieuwe radarantennes met elektronisch gestuurde bundels” in TNO-nieuws, 27(6) 1972, pp 269-276.